Add wine to the pot and simmer until it's almost all absorbed. Begin adding the stock, about half a cup at a time. Wait for the grain to absorb most of the liquid before adding the next half-cup. 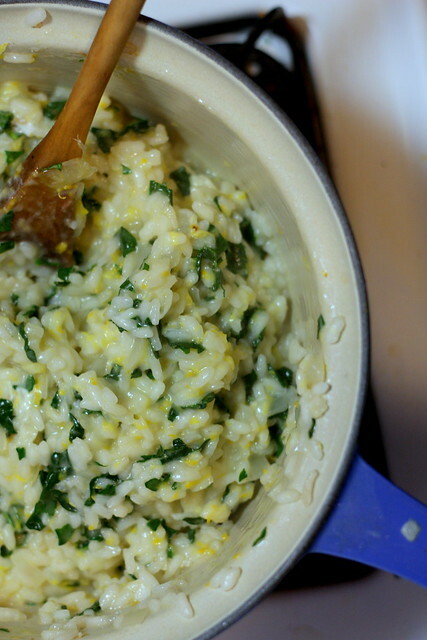 You'll know the risotto is done when it's soft and no longer crunchy. Swap out farro or pearled barley for the arborio rice for more of a whole-grain-y meal. You'll need to up the stock and the cooking time, since they'll take longer to cook and absorb more liquid in the process.